How to Use Steempeak's Latest Feature - Snippets! I normally write my posts either on Busy.org or Steemit.com. I've kept my eye on Steempeak for a while now, but never made the full switch to using it more often. For reading posts/watching DTube Videos, I'm usually on-the-go and using Partiko. Just earlier today, Steempeak announced the Snippets feature. This feature allows you to save commonly used text and even markdown code so that you can easily input them into any of your posts. Originally Posted on My Blog. Click Here to Read This Post on My Website! Prior to this Steempeak feature, I would go to an old post of mine on Steemit.com and then copy/paste the markdown text from there. Now with Snippets, I can insert any snippet I've saved with just a few clicks and never have to leave my tab. To create a snippet, just head over to Steempeak.com, login and then hit the "create a post" icon at the top right by your username. Once you're at the create a post screen, you'll see a little button just below the text box that says "SNIPPETS". 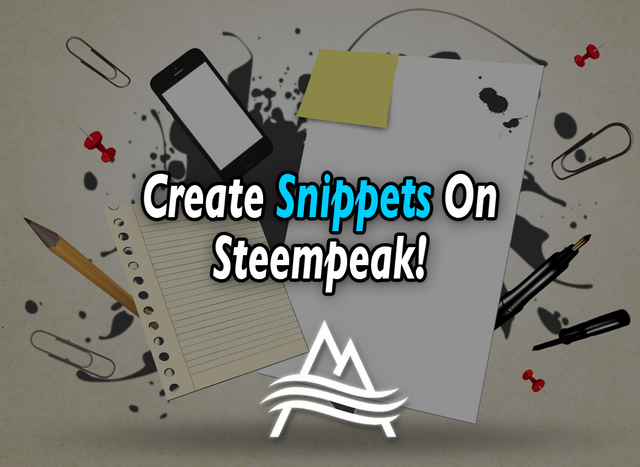 Click that button and then create a name for your snippet so that you can easily pick from your library of snippets. Then just add the text/markdown code for your snippet and you're all set to start inputting snippets into your posts! Inserting a snippet is easy. Once you've got it saved, just click the snippets button below the text box, hit copy and then the window will automatically close. Click back on the text box and paste in the snippet from your clipboard. Signup for a Steem Account on Khaleelkazi.com, earn a 90 day delegation! p.s. you can now sign up for a Steem account directly on my website, https://khaleelkazi.com. The signature at the end of each of my posts will have an option for instant account creation, powered by @steem.ninja. Steem.ninja gives a 90 day delegation of 15 SP with your account. I'm going to match their 90 day delegation to you for a limited time (I haven't decided how long yet, I'll announce it on my blog when this promotion ends). We are glad you like the feature and hope it helps you and many other save a lot of time and energy. The feature is great, I’m really happy to see it added to the platform and I already know it’s going to be a big time saver for me and many others, keep up the good work!! Thanks for the little tutorial need to play around with it a little looks like a real useful tool. I am new to SteemPeak but really like it so far. Just learning all the tools SteemPeak has to offer. Anytime! I am just diving into steempeak myself and look forward to sharing more tutorials like this so we can all learn how to use it to make our blogs better! I need to make use of this. Seems like such an awesome tool and I really haven't taken advantage of signatures or snippets up to this point. Need to just bite the bullet and spend some time one day creating some. Absolutely! We all tend to get really comfortable with the interface that we first join Steem with. For me, I’m still pretty hooked on Steemit. I occasionally use busy and I heavily use Partiko for mobile. Steempeak seems like it is the most feature-rich interface out there! Yeah it takes me a while to learn the new interfaces and I usually end up back on Steemit most of the time, but it's very nice to have options especially ones that have better tools and UIs for the users. My time on steemit vs other options is becoming less and less every week. You just got a 7.98% upvote from SteemPlus!